Now you make me want to try drinking it… The essential oil that is, not the perfume. Another heady ylang scent is Mahora. Why oh why are all those beauties discontinued? And replaced by fruity toilet freshener-like scents. UGH!!! Yey, I thought I was the only person in the world who liked Ylang Vanille. It is so sun-kissed and creamy in summer I adore it. I admit there is a certain plastickness to it at times, but tant pis, je l’aime quand meme! I’ll have to go to Isetan in Osaka, they have all the Guerlain exclusives, at ridiculous prices of course. I have never heard the name Mayotte. I also need to check Caron. They said they “might” have Tabac Blond from May. That one I will get, at whatever price. It’s number one on my want list now. It is an amazing perfume. A REAL perfume. A perfume fairy just sent me some Mahora now Mayotte. Can’t wait to sniff it! I wonder if it is as heavy, thick and tropical as the original, which was a kind of Frangipani Samsara. Ma-whora indeed…. Ma-whora? Snort and giggle! I have nothing to compare it too, but I will let you know if it has a touch of the decadently indecent. To be honest, as much as I enjoy Mahora, it is not the most intelligent of perfumes. It smells like an over bronzed rich woman in Antigua who has boozed away too many brain cells…. Over bronzed rich woman in Antigua who has boozed away too many brain cells….LOL. I wonder what that says about me who loves Mahora. I have Casper-like pale skin and only drink on occasion. Hmmm. Maybe the picture you paint is what I am aspiring at??? Or am I compensating with perfume for what I’m lacking? Maybe I’ll make Mahora my SOTD for tomorrow. I’m still waiting to get any kind of reaction from my colleagues, but so far nothing. I can wear whatever I want. Woohoo!! I was aware of how rude this was as I wrote it (knowing you love it) BUT after all I was only trying it on myself! I didn’t think you were shocked. But you know I write without thinking! One drop of ylang ylang essence in champagne? Decadent indeed, my dear Narcissus! I bet I would love it too. Will let you know if I do! It worked for me….beautifully. But REALLY perfumey…….you have to be feeling giggly I think..
“Calice Becker’s new perfume for Oscar De La Renta Mi Corazon (similar to By Kilian’s Beyond Love, but with a shirtier, ylang ylang twist)” – Oh no, now this is another one I must try! I love Beyond Love and y/y is always high on my list of favorite notes. It’s quite good, but not as expensive (and ‘thus’ not as good perhaps), but quite nice in that rich-woman-in-the-tropics kind of way: I would wear it, but think that it lacks a certain poetry. WHAT!!! a remake of Nocturnes? How did I not know about this? Curious as to whether or not you have gotten to the sample of 40 Notes Exotic Ylang Ylang? Oh yes, I had forgotten that. 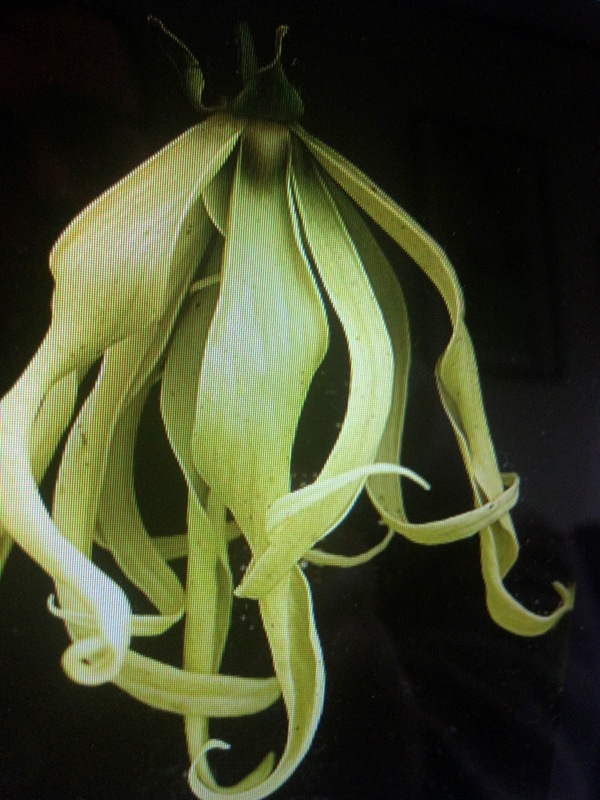 Curious indeed and very jungley gardenia I think I thought, but not a creamy ylang….I will do a review of it. As for Nocturnes, I can’t believe it. An actual new perfume with the same name, like Miss Dior….. I mean it might be ok, as it is apparently an aldehydic thing with a lot of the same notes, but it will certainly not be ‘our’ Nocturnes…. and yet, I will still be curious to try it! Me too, strangely. We must be optimists. Quite agree with you on these two. Nocturnes I have yet to re-try so will hold judgement, I’ve yet to smell the new Aimez Moi, but I fear for it. Far be it from me to give business advice, I’m not the mercantile sort, but it seems to me that the problem at Caron is not necessarily its perfumer, but that the house as whole lacks direction. In this respect it reminds me of Guerlain during its interregnum: creative in fits and starts but without cohesion or clarity of purpose. The big problem is that Caron, unlike Guerlain, seems neither to have the budget nor the fan base to ensure that its classics are well maintained and that time is allowed to roll out new releases probably. Makes every Caron vintage perfume now seem impossibly precious……Aimez Moi remixed? NO. It is such a glorious thing that violet…..
Hmm, I only got as far as sniffing the nozzle of My Ylang – I am a bit of a ylangoholic myself, you see, and always perk up when I see the note – but was not moved to spray it on skin or even card. Then I read a glowing review by another blogger and thought maybe I had missed something. Now, having read your take on it, I think maybe not after all… But I will still give it a sniff if I see it again – though I will be disappointed if there isn’t much ylang in there as you say. I love the expression Ylangholic, and so much of one that reading your comments about the possibility that I may have missed something makes me want to go and smell it again myself even though I have totally dissed it here (I NEVER can’t think of anything to say about something). Perhaps it was trying to do Ylang in a more subliminal way; maybe there is something subliminally beautiful about it, but overall it just seemed obvious to me that with a strange, but oddly beautiful, name like ‘Caron My Ylang’ the perfume itself was a wasted opportunity. I did like Eau Moheli in a way, though my review was far too positive I think. On further reflection there was much more banality in that scent then I had realized, and yet it does have quite a nicely all encompassing Ylangyness about it. Which YY scents do you think are best? I am always on the look out. I think you are right about Nocturnes…leave well enough alone and stick to your vintage version. I had a brief sniff of the new one and could see the similarities, but am sure that it won’t have the delicious vetiver/vanilla I love in the original. I agree with everything in this review. Certain critics seem to take a sadistic delight in scorning Caron even when the perfumes are perfectly good. I own some in old and modern versions (pre current IFRA) and challenge some writers who claim they are world’s apart to tell me which is which. That said these two are pretty bland. In fact, you are a model of generosity to Piu Bolldogia. The new Nocturnes continues the downward slide of that scent, which I would say has been perceptible rather than catastrophic over time (it was after all a work of retro-mania from the off). The N’Aimez Moi, however, is little touched and continues to be one of the most under-rated violets out there. Plush, gothic, velvet, teenage horror movie stuff. Wonderful. Did you know that for a long while Caron ran two separate production lines? One in France and one in the US, where perfumes were ‘assembled’ from essences. I only discovered this fact recently looking through old advertisements and have been wondering how long the practice continued and if, indeed, it still goes on. Chanel, I believe, did the same, and ‘For Him’, the US version of ‘Pour Monsieur’ from way back when, I’ve heard was quite different apart from the Anglicisation. The odd thing about Caron is that some of the recent(ish) scents are none to bad… Parfum Sacre, Mantaigne (that everyone I think apart from you, me and my mother seems to hate) and N’Aimez Moi being three.